A yogurt cocktail might sound crazy if you're new to soju, but yogurt soju is popular in Korea and all over Asia. The best part is it can be made with only three ingredients. You'll find it in private homes and prominently displayed on bar menus. This Korean yogurt cocktail recipe is made with soju (a clear distilled liquor made from rice that many people liken to vodka), fruit-flavored or plain Asian yogurt drink (similar to kefir or lassi), and a fizzy soda. Sprite or 7-Up works fine but some recipes call for fruit juice instead of, or in addition to, the soda (grapefruit juice is popular for its tart flavor). Soju, itself, also comes flavored (peach, blueberry, and pomegranate flavors are popular) and they can be used as an alternative to unflavored Soju. Don't be afraid to experiment to see what combinations you like best, as it's difficult to make a bad Korean yogurt soju cocktail. It’s delicious, refreshing, and tangy. But they can sneak up on you. So proceed with caution! Into a stainless-steel cocktail shaker filled with ice, pour equal parts soju, yogurt drink, and soda. Shake until ingredients are thoroughly chilled. Soju is a common, highly potent alcohol in Korea. It's made by fermenting and then distilling a mixture that contains mainly rice and a blend of wheat, barley, and even sweet potatoes and is clear and mainly tasteless, much like vodka. 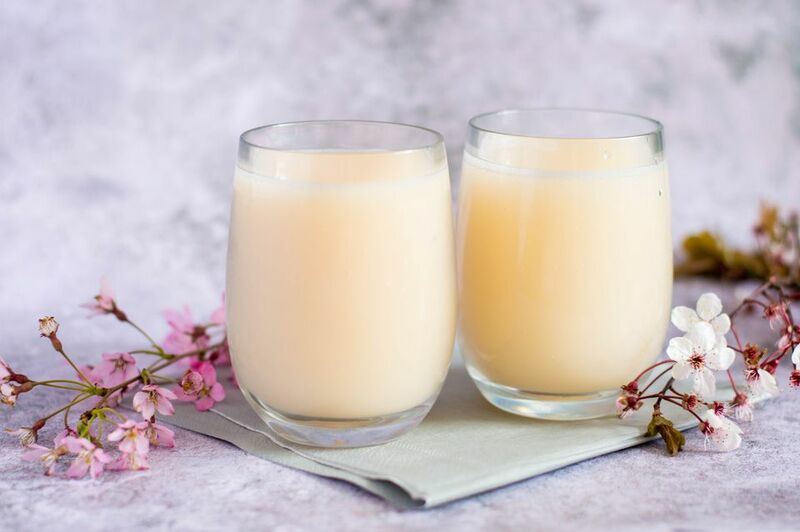 This recipe uses an Asian-style yogurt drink that is a milk-based drink. It is watery compared to American yogurt, somewhat similar to kefir or lassi. You can try an American yogurt drink if you don't have access to the Korean yogurt, as long as it's not too thick. You can use the plain (regular) flavor, but people do use the peach, strawberry, orange, melon, lychee, mango, and other fruit varieties as well. Any of these flavors can be used to make your yogurt soju cocktail. In fact, there are numerous variations on the basic recipe, some of which include fruit-based garnishes. Both yogurt and soju go well with the fiery aspects of Korean cuisine, so it makes sense that they'd be mixed into a cocktail by Koreans. But be careful, as the most common complaint about yogurt soju is that it's so easy to drink, you're drunk before you know it.